IT GOT TO the stage where I was thinking, If this is the English August Bank Holiday it must be Brighton….Or, If this is the American Labor Day Weekend it must be Louisville, Kentucky….Or, If this is the Japanese Be-Respectful-To-The-Elderly Public Holiday it must be Sendai….And, finally, If this is Sci-Fi Day at the Municipal Public Library it must be Blacktown…. The series of conventions, one on top of the other, started in Sydney with the Australian National Science Fiction Convention, the Syncon, the venue of which was the Crest Hotel in Kings Cross. This was held from August 10 to August 13, although the four Guests of Honour from overseas arrived on August 5. The Professional GoH was American author Gordon R. Dickson. The fan GoHs were Ken and Linda Fletcher, from the USA, and Kouichi Yamamoto, from Kyoto, whose visit was sponsored by the Australia-Japan Foundation. 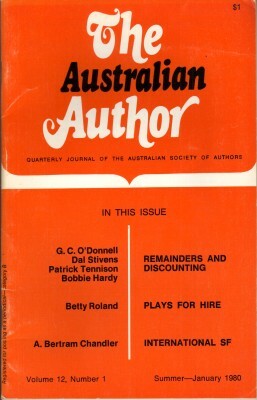 The majority of the Australians attending the Syncon (the membership of which was about 300) were from NSW although there were delegations from all other States. The Syncon was a well organised convention. There were the usual panels, talks and film shows. After the banquet there was the presentation of the Ditmar Awards for the best science fiction in various categories published in 1978. George Turner received his for his novel Beloved Son. That for the best overseas novel went to Anne McCaffrey for The White Dragon. It was accepted on her behalf by one of the West Australians, as Miss McCaffrey will be the Guest of Honour at this year’s Australian National SF Convention in Perth. After the formal acceptance the Ditmar was entrusted to Mr John Foyster so that he could present it again, to Anne McCaffrey in person, at the World Convention (the Seacon) in Brighton, England. Several people, including myself, have complained that, from year to year, the Ditmar has appeared in various shapes and sizes, whereas the prestige international awards, such as the Hugo and the Nebula, have long been standardized in format. Some of us have wanted the name of our own Award changed—to the Matilda (my own suggestion) or the Southern Cross. The name Ditmar (meaningless to most people and pointless to those of us who know its origin) has been retained but there is, at last, a standardized design—two perspex elongated pyramids, apex to apex, with glittering stars set in the upper one. Some weeks prior to the Syncon I was shown one of the new Ditmars and asked what I thought of it. I gave voice to my disapproval. The five stars did vaguely resemble the Southern Cross but (a) the constellation was upside down and (b) Epsilon Crucis was displaced quite a few light years so as to appear outside the cruciform framework. I was told the story. The artist commissioned to do the job didn’t know what the Southern Cross looks like. Instead of copying from the Australian flag or an air mail sticker or whatever he went out at night to look at the sky. One theory is that he got the wrong constellation. “He deserves to have them hurt,” I said. There was another inexcusable mess-up which, luckily, was spotted in time. Each of the Guests of Honour was presented with a suitably engraved tankard. Rather surprisingly the engraver succeeded in spelling Kouichi Yamamoto’s name correctly. But the “Guest” of ‘Guest of Honour” was spelled “Gest”. Shortly after the Syncon goings-on I left Sydney for London so as to attend the Seacon, in Brighton, from August 23 to 27. My flight was by Qantas during it I was privileged by a visit to the flight deck of the aircraft. One of the fans attending the Syncon is the daughter of a Qantas captain who, too, is a science fiction reader. She told him that she had met me. He remembered a story of mine, written many years ago, in which I made use of an inertial navigator. (The locale was Venus—and the tale was penned back in the Good Old Days when everybody thought that the planet was a watery world and that the perpetual cloud cover was water vapour. My colonists used surface ships for most of their transportation and, for obvious reasons, astronomical navigational techniques could not be used. So, working from my knowledge of the gyro compass, I “invented” an inertial navigator…) He suggested that I might like to see the real thing in operation. I was pleased to discover that it actually works. Apart from that the flight was a normal one, although the Qantas standards of service are far better than those of certain other airlines. It did, in fact, seem that everybody was at the Syncon, the attending membership of which was 3,199. There were English, Americans, Canadians, Poles, Russians, Yugoslavs, French, Italians, Spanish, Belgians, Dutch, Australians, Japanese, assorted Scandinavians. There were two professional Guests of Honour, Brian Aldiss and Fritz Leiber. It would take too much time and paper to list all the other professionals present. Seacon’s organizers, however, had done their best to find jobs for everybody. I had been asked if I would be willing to participate in one of the autographing sessions, this being of one hour’s duration. I was partnered with Wilson (Bob) Tucker. (As always at SF conventions one seems to do more book signing at odd times and places than at the appointed time and place. And, once again as always, one learns, by having them thrust before one, of pirated editions of one’s works. . . .) I sat on one of the panels—The Pleasures and Pitfalls of Series Writing—with Anne McCaflrey, Marion Zimmer Bradley and Larry Niven. All of us agreed on one thing—that the main pitfall is getting trapped in one’s own series. The banquet had its amusing movements. Brighton is very much a convention town and hotels such as the Metropole have long experience of handling such affairs. The tables had been set up in the main ballroom and under the scowling eye of the head waiter—who seemed to be playing Captain Bligh as libellously played by the late Charles Laughton—the serving wenches served and cleared at the double. Not surprisingly conversation at table was frequently interrupted by the crash of dropped crockery. Perhaps the Seacon was rather too big. It was impossible for everybody to be accommodated in the Metropole; we were spread among hotels along the entire sea front of Brighton and even neighbouring towns. Consequently it was very hard to find people whom one wanted to meet. A short while later, in New York, one of the senior editors of Berkley-Putnam told me, to my surprise, that he had been at the Seacon and, representing his company, had thrown a party. He had found it utterly impossible to round up writers, including myself, published by Berkley Putnam. Nonetheless I enjoyed my visit to England, my first time in the country after an absence of twenty-four years. I could not help feeling, however, that I shouldn’t like to live there. Apart from the climate there is the high rate of inflation. Comparing notes, all the Americans, Canadians and Australians agreed that the English pound, in England, had about the same purchasing power as our own dollars in our own countries. But it was good, very good, to meet old friends, such as Arthur C. Clarke, making one of his rare excursions from his adopted country, Sri Lanka, and to meet my son-in-law, Ramsey Campbell, an increasingly prominent English fantasy writer. I met another author whose work I have long held in high regard—Kingsley Amis. The circumstances of our meeting were rather amusing. I’d been asked to the Scandinavians’ hospitality suite. After one drink I tore myself away; there was a talk that I wanted to hear. Out in the corridor, however, I ran into Brian Aldiss and Harry Harrison, who were in the company of two distinguished looking literary gentlemen whom I did not recognise. Brian asked me to come to his GoH suite for afternoon tea. On our way there the two strangers were, I was to learn later, reminiscing about a very highly regarded but long defunct British fan magazine called Slant. One of them said, ‘And then there was that obscene piece by A. Bertram Chandler. . .“ I must have flapped my ears rather audibly because they turned to look at me and then to peer at my name badge. One of them—it was Kingsley Amis, the other was Robert Conquest - asked rather embarrassedly, “Are you Bertram Chandler?” I said that I was. And then the three of us chorused the punch line of the “obscene piece”. Even though it had been written over thirty years ago we could all remember it. On August 29 I took the TWA flight from London to New York, I was, too, booked to fly TWA from New York to Los Angeles—but changed my booking to American Airlines. The reason was that TWA has clambered far too enthusiastically aboard the anti-smoking bandwagon. After take-off from Heath Row the entire aircraft was declared a non-smoking area. I could not help but wonder how many of my priggish fellow passengers were owner-drivers of the prime cause of atmospheric pollution, the motor car. After arrival at La Guardia, behind schedule, there was just time to smoke a much needed pipe and then, having passed through Immigration and Customs, to proceed by taxi to JFK to catch the American Airlines flight to Louisville. The NorthAmericon, the USA’s National Science Fiction Convention for 1979, was not as big as the Seacon but it was big enough, with just under 2,000 attending. Most of these could be accommodated in the convention hotel, the Gait House. The desk was very obliging iii helping to locate people. The Committee had made arrangements whereby groups of Faithful Readers could take their favourite authors out for a meal, lunch or dinner. On two occasions I was a grateful guest— once at a dinner party (at which we drank Foster’s Lager) and the second time, with the Guest of Honour, Fred Pohl, on an excursion to the Mammoth Caves. The Gait House stands on the south bank of the Ohio River, almost overlooking the wharf at which the Belle of Louisville, a quite authentic looking stern-wheeled river steamer berths. Frequently throughout the days and evenings we would hear the plaintive notes of the vessel’s steam calliope. I had booked well in advance for the river cruise. This was a very enjoyable evening, even though those In charge of the catering had not brought enough mint syrup to maintain the supply of genuine mint juleps to those desiring same—which seemed to be just about everybody on the cruise. On the last day of the NorthAmericon a group of spelunking fans took Fred Pohl, Dr Betty Anne Hull and myself to the famous Mammoth Caves. They are located quite a long drive from Louisville. Unfortunately we had time only for one of the shorter tours, the historical one. There were two guides, the senior one saying her pieces— and very well, too—and her assistant scurrying away as required to attend to lighting effects and to switch on recordings. One of these was the Soliloquy from Hamlet in a relatively small side cavern called “the theatre”. Many years ago the famous actor Edwin Thomas Booth (the brother of Abraham Lincoln’s assassin) mounted the “stage” in “the theatre” and delivered his favourite speech from his favourite part. Outside “the chapel—another side cavern—we were given the experience of total darkness, after which even the tiny flare of a struck match was blinding. Then we were treated to an exhibition of torch throwing, an art developed by the guides in the days before electricity was in wide use. The torch is a small bundle of rag soaked in kerosene on the end of a spiked stick. It is ignited and then, with an expert flick of the wrist, hurled into some strategic corner of the cavern to be so illuminated. There was “Fat Man’s Misery”—a tortuous passage through which one can barely squeeze. There were “The Ruins of Karnak”—spectacular formations Like the lofty pillars of some ancient temple. There were the relics of the Amerindians who used the caves for a supply of gypsum and other minerals millennia ago. There were the more recent relics—the pits in which saltpetre (for the manufacture of gunpowder) was extracted from the cave dust during the American War of Independence. The temperature of the Mammoth Caves is a steady 53° (Fahrenheit, of course; the Americans have yet to succumb to metric madness. Come to that, the English—despite the EEC—still maintain small pockets of resistance; in most pubs beer is served by the pint or half pint). Eventually back at the Gait House and later that evening we were able to watch from the balconies the Labor Day Weekend fireworks display, the various pyrotechnic devices being fired from a barge moored in the river. Another Labor Day bonus for the conventioneers was the International Heritage Festival, the stalls for which had been set up along the belvedere outside the hotel. Many of us took our lunches from these, nibbling various national delicacies. I was rather amused by the lay-out—-Ireland was a buffer state between the Israelis and the Arabs. I was both amused and somewhat shocked by the Israeli attempt to adjust to local mores. I was attracted by the flutter of blue-and-white flags over the Israeli booth and then I saw the sign: SHALOM Y’ALL…. On the morning of Tuesday, September 4, I emplaned for New York Fellow passengers were Lester del Rey and his wife Judy-Lynn. As they are both non-smokers we did not sit together but were looking forward to the conversation, mainly reminiscing over old times, in the taxi we shared from JFK Airport to the city. (I first met Lester during World Wax II, when he was just making his start as a writer. Judy-Lynn - at that time Judy-Lynn Benjamin - I came to know some years later, although only by correspondence, when she was on the editorial staff of Galaxy magazine. Both of them are now with Ballentine Books.) Sadly, we were unable to enjoy the do-you-remember-when talk. All the way in to New York the cabby earbashed us with his jaundiced views on the big city, on the United States and on the world in general. Once—during World War II and immediately afterwards—I used to love New York. I returned there, after an absence of 30 years, in 1976 and really hated the place. It is not at its best during a heat wave. I was there again in 1978, during the Northern Hemisphere spring, and found my old affection returning. This year it was at the tail end of summer, still hot and humid, but the old magic seemed to be exercising its spell again. Much of the city is run-down and shabby, with pot-holed streets and cracked, subsiding sidewalks and everywhere the sort of litter that we see, here, only after several days of a garbos’ strike - but a city is more than just buildings. Somehow there was a spirit of friendliness abroad. Most of my time in New York was occupied with business, talks with my agent and with various publishers. On my last day there— Saturday, September 8—John Silbersack, senior editor with Berkley-Putnam, accompanied me on a browse through several of the big book-shops. Actually I was trying to find a book on household plants for my wife but nobody seemed to have that particular work in stock. Eventually we tried Barnes & Noble, Discount Booksellers. It is a vastly bigger establishment than similar places in Sydney. Furthermore there is a quite fantastic range of titles. I still didn’t find the particular work on indoor gardening that I was looking for but got another one that was almost as good. And, inevitably, both John and I emerged from the store heavily burdened. That night I was in Los Angeles, booked into a hotel just across the road from Mann’s Chinese Theatre. I was fascinated by the polished brass stars set in the sidewalk, each pentagram containing the name of some film actor or actress. Some of these were familiar, even though their last appearance on the screen was many years ago. And others? My reactions were, Who the hell was he (or she)? Even a local friend, himself an actor, confessed himself baffled. Flying with JAL I left Los Angeles at about noon on September 12, arriving at Narita Airport shortly after 1600 hours on September 13, having (a) crossed the Date Line and (b) put my watch back several hours. I was met by representatives of my Japanese publisher. We took the shuttle bus to the railway station - which is outside the airport - and then the Skyliner Express into the city, which makes the run in fifty minutes. Then there was a long taxi ride to the hotel - one of Tokyo’s few skyscrapers - into which I had been booked. The ride was long in time rather than in miles - Tokyo’s traffic congestion has to be experienced to be believed. In theory Mount Fujiyama was visible from the windows of my room. In practice ti was not. The smog was not as bad as it had been in Los Angeles hut it was bad enough. That night I was given dinner in one of the hotel’s dining rooms by Koichiro Masahiro Noda, my translator, and a large party of Faithful Readers. Unluckily jet lag prevented me from enjoying the occasion properly. The next day I had an appointment with Mr Tom Mori, my New York agent’s Tokyo agent, and Mr Mitsuru Kaneko of the MK Company, a firm that makes animations for Japanese TV. In the afternoon I was pleased to meet again Kouichi Yamamoto, who had come in from Kyoto to see me. In the evening there was a dinner party at a restaurant specialising in Fukuoka-style chicken, during which I was treated to a sample of the Japanese humour which, in many ways, is similar to my own. One of the courses was a grilled half chicken. Keiko’s bisected chook wasn’t too well done. She turned it over and prodded the obscene looking, almost raw flesh with her chopsticks and said, “Look! Alien!” (We had all of us seen the film of that name-myself in New York. The horrible thing that got aboard the spaceship Nostromo had an underside just like that almost raw chicken and, after it had been killed, was prodded just as Keiko was prodding her portion. In Tokyo I was told that the science fiction fans in Sendai were about to hold their very first convention, the Datecon. (The “e” accented.) The dates were September 15 to 16, coinciding with a Japanese public holiday weekend. As far as I could gather part of it was Respect To The Elderly Day. (By this time I was feeling somewhat elderly.) Learning that I was in Japan they invited me to be one of their Guests of Honour. So, at about noon on Saturday, September 15, I was put aboard the express train for Sendai, accompanied by one of the Tokyo fans who would also be attending the Datecon. It was a very pleasant journey. Nearing Sendai I was intrigued by the local custom in the rice paddies. Elsewhere in Japan the straw is strung up to dry just as washing is on a line; here it was assembled in man-sized and -shaped figures, presumably as scarecrows to guard the as-yet-unharvested rice. They could have been Wookies on leave of absence from Star Wars. At Sendai we were met by the local fans and taken to the hotel into which we had been booked and where we were to have dinner with Mr Yano—a prominent Japanese SF writer—and Mrs Yano. Mr Yano tried to persuade me to have beef steak-an expensive luxury-for my meal. I ordered salmon steak-pointing out that in Australia salmon is as big a luxury as beef in Japan. After dinner we went to the “stag party—I use inverted commas fore and aft because ladies are present on such occasions—which is the opening event at Japanese SF conventions. A room packed with fans, a table laden with snacks and bottles, everybody talking and some, now and again, listening. - . We were joined there by one of the other Guests of Honour, Mr Tekumi Shibano (whom I had last met in Brighton, at the Seacon), and his wife. When I left the party was still going strong. Datecon opened with a series of sketches. The first one was a reenactment of the “egg sequence” from the film Alien. The second one was a duel to the death between Batman and Scorpionman with an Imperial Storm Trooper (Star Wars) and a young lady armed with a flamethrower (Alien) getting into the act somehow. The last one was 2001. The monolith and the shambling subhuman…. . . The rush of brains to the head resulting in the use of a bone as a weapon…. . . . The throwing of the bone into the sky by the exultant ape man.... And then a long, long model of the huge Jupiter ship was carried on stage by four Kabuki “invisible men”, black-cloaked and -hooded. (In Kabuki theatre the “invisible men”, whom you’re not supposed to see, are scene shifters, make—up artists and dressers.) On the stern of the ship was the name, Datecon. Then there were the usual talks and panels and for those not interested—or suffering from linguistic disability—non-stop showing of videotaped SF movies. Then each of the GoHs—Mr Yano (writer), Mr Shibano (writer and translator), Mr Miyatake (artist) and myself— was presented with a beautiful Japanese doll as a souvenir. The following day, Monday, one of the Convention Committee, Miss Yoko Oyama, and another fan took Mr and Mrs Shibano and myself for a tour of the city and its environs. We visited shrines and a Buddhist temple, one of the many in which there is preserved a small portion of Buddha’s skeleton. Then Mr and Mrs Shibano and myself caught an afternoon train back to Tokyo. I was booked to fly out, by Qantas, the following evening. Luckily there was time for me to be taken to see Galaxy Express 999, one of the feature-length animations which the Japanese do so well. I loved it. There was the romance of the old, long-distance steam train combined with all the Space Opera clichés. It was utterly absurd—but beautiful. It was a fairy story making a great appeal to people of all ages. That day there was some sort of sabotage scare at Narita so only intending passengers were allowed at the airport, and then only after pre-flight baggage checks. (For some obscure reason I had to transfer my Swiss army knife from my pocket to my flight bag.) I made the initial check~in at the city terminal and took the bus from there to Narita, a seventy-minute journey. (Passengers are warned to avail themselves of the toilet facilities before boarding the bus. Then, in the seat pocket, there is a card, blue on one side and scarlet on the other. If your bladder or bowels are about to burst you’re supposed to show the blue side of the card to the driver. If you’re having a heart attack or whatever you show him the red side. . . The flight back to Sydney was quite comfortable. But, not for the first time, I was incommoded—as were many others —by the unavailability of luggage trolleys at Kingsford-Smith Airport. Airport managers in most other parts of the world seem to be able to predict with considerable accuracy the number of trolleys that will be needed—and then increase their “guestimate” by at least 50 per cent. In Sydney one gains the impression that the original underestimation is reduced by about 75 per cent. After all the foregoing I thought that I’d had my whack of SF conventions for a few months. Shortly after my return, however, I was invited to put in an appearance at the Blacktown Public Library’s Sci-Fi Day. I accepted. It was an enjoyable occasion, almost what we call a MiniCon. And that was the last convention for quite a while. I have to catch up with my writing.